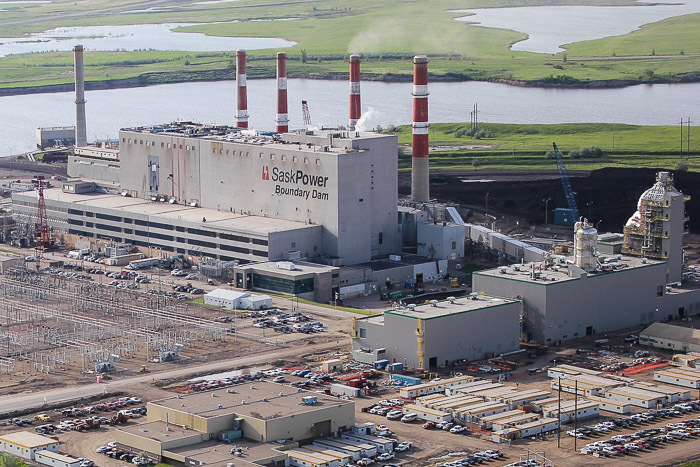 GLOBAL ENERGY INTERESTS are keeping a close eye on operations at the Boundary Dam Power Station in Saskatchewan these days, now that SaskPower has begun operating its rebuilt coal-fired Unit 3 with carbon capture and storage (CCS) capability. The $1.35 billion project went online October 2. 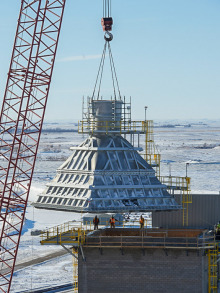 It represents the world's first use of utility-scale, post-combustion carbon capture and storage. The project has worldwide ramifications. Reducing man-made carbon dioxide emissions is widely regarded as essential to slowing climate change. CCS holds promise, but it has not been proven at a level large enough for utilities to begin adopting the technology. SaskPower CEO Robert Watson hopes the Boundary Dam project will change that. "We sincerely expect this to become a model for plants around the world. This is what we think is a long-term, fiscally responsible way of getting less emissions into the air." Several hundred Local 555 members and traveling Boilermakers from across Canada took part in the project, rebuilding the Unit 3 boiler; lifting and setting pressure vessels, including the absorbers and strippers; and assembling the extensive ductwork needed to carry the flue gas through the capture process. 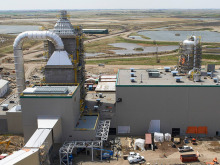 Contractors included Babcock & Wilcox (boiler rebuild), SNC-Lavalin (carbon capture system), BFI (ductwork), ES Fox (process equipment) and a joint venture of Alberici and Balzer's Canada Inc. (turbine replacement). The new Hitachi steam turbine is rated at 160 megawatts; however the net output for Unit 3 is estimated at 110 megawatts, allowing for the CCS system's energy requirements. THE BOUNDARY DAM approach to capturing carbon dioxide is to channel flue gas through a two-stage process. In the first stage, sulfur dioxide (SO2) is absorbed into an amine solution and sent to a "stripper," which pulls out the SO2 for additional processing. With the SO2 removed, the flue gas then enters a second absorber, where another amine solution binds with the carbon dioxide. A second, larger stripper separates the CO2 into a pure stream for delivery to a compressor room, where the CO2 is converted to a liquid and piped offsite. The process will capture an estimated 1 million tons of CO2 annually. Much of it will be shipped 41 miles by pipeline to oilfields for enhanced oil recovery (EOR). Surplus CO2 will be injected two miles deep into a brine and sandstone water formation for geologic storage. In addition to CO2, there will be opportunities for the sale of other by-products from the project. The captured sulfur dioxide will be converted to sulfuric acid and sold for industrial use. Fly ash, a by-product of coal combustion, will also be sold for use in ready-mix concrete, pre-cast structures and concrete products. "The Boundary Dam project is important not just because it's the first of its kind, but because it demonstrates a way to help make carbon capture technology economically viable - by turning unwanted pollutants into valuable commodities," said Doug Vine of the Energy Collective, an independent forum on energy policy. 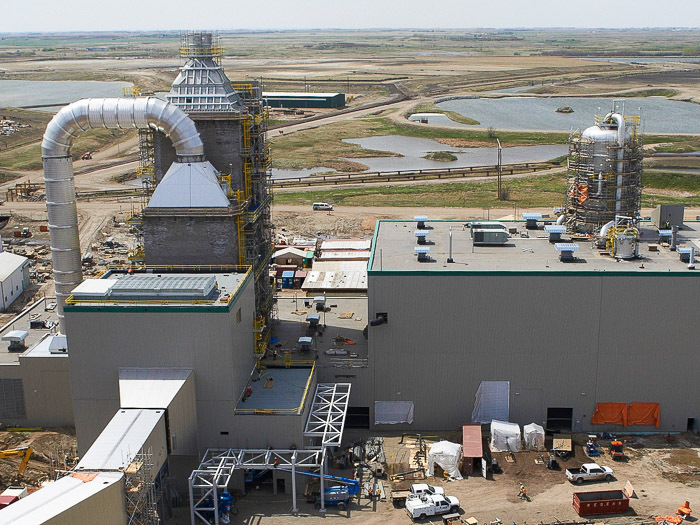 As SaskPower puts it, the company "is leading the way to make a viable technical, environmental and economic case for the continued use of coal." To view a video description of the project visit SASKPOWERCCS.COM. Reprinted with permission from boilermakers.org.